I just heard L. Worth Seagondollar speak of his experience as a graduate student on the Manhattan Project, figuring out the critical mass of plutonium required for an explosion. His talk ranged from amusing anecdotes about military vehicles breaking down and menacing guards watching his every move to serious accounts of the blazing radiance of the bomb and its terrible destructive power. If you get a chance to hear him speak of his experiences, take it. My favorite part of the talk, however, was during the Q & A when Gary White of the Society of Physics Students mentioned that he had heard that the sphere of plutonium had been dropped. From Seagondollar's reaction, it was clear that there was truth to this rumor. In fact, he was responsible. He had been working late in the lab, his shift between midnight and 8 a.m. The plutonium was set up in two hemispheres, each side covered in a layer of a metal that Seagondollar believes to be silver in order to keep it from oxidizing and entering the respiratory systems of researchers. The two hemispheres had a hollowed-out region in the middle, about one inch in diameter, to house a neutron source. 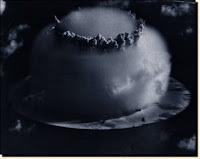 Seagondollar had bumped the plutonium sphere, causing it to topple. One hemisphere hit the bench, the other fell toward the floor but was scooped up by Seagondollar's hands before it struck. He quickly put them into an ionizing chamber to be sure that the silver layer had not been damaged, putting him at risk. The layer was fine. Unfortunately, the hemisphere that had landed on the table was bent so that the two halves no longer fit together. In Wisconsin, we learned to take care of problems ourselves, said Seagondollar in reference to his to his alma mater, the University of Wisconsin. He expressed some doubt about this wisdom as it led him to find a ball-peen hammer and reshape the hemisphere by striking it (ever so gently). He reports that Oppenheimer spoke to him the next morning, saying only that it was lucky for everyone that Seagondollar handled the incident as well as he did.